The Zinnia Patch: it's sat...er...thurs...um...I mean...friday! 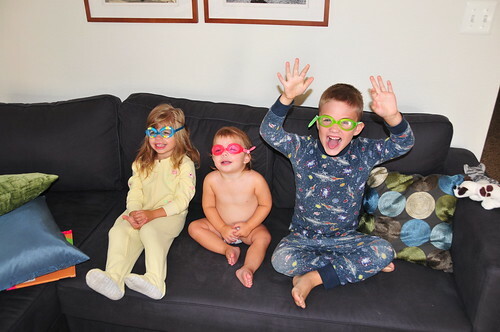 Pajama's at noon, bare tummies, stuffed animals lined up "for their meeting" (I'm not sure, you'll have to ask Kenna) and swim goggles in the bathtub...important things! Who needs to know what day it is? For the past month, Shawn has been on leave (a.k.a. home with us) so every day feels like Saturday around here. We have enjoyed lazy, three-cup-of-coffee mornings, bike rides to the pool, mid-week visits to museums, projects galore, finding a new church, getting to know our new (wonderful!) neighbors and community...oh right and that little issue of moving our household from one state to another and all that. Details, details. Shawn does still have a job and that job will be resuming next week, so we feel a bit like school kids on their last days of summer vacation. The good news is Shawn's new job is located about three minutes from home (rather than the hour and a half he was driving before!) and will have normal hours (even many short days, and no deployments!) 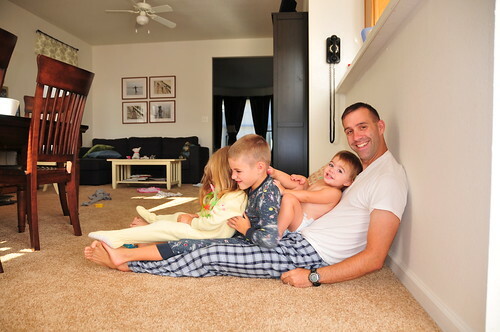 Actually, from what we hear, this job (it's a school, really) is considered a year-long breather for military families who have been enduring long days, flight schedules and deployments. Sigh. Did you hear that? It was the sound of a ton of bricks falling from my shoulders. That felt nice. So while our vacation may be coming to a close, we are thrilled to be entering this year of rest. family. time. together. I am so looking forward to some downtime in the near future too! Looks like you are getting settled pretty easily. omar is taking a whole week off in a couple of weeks and i'm beyond excited for the down-time!